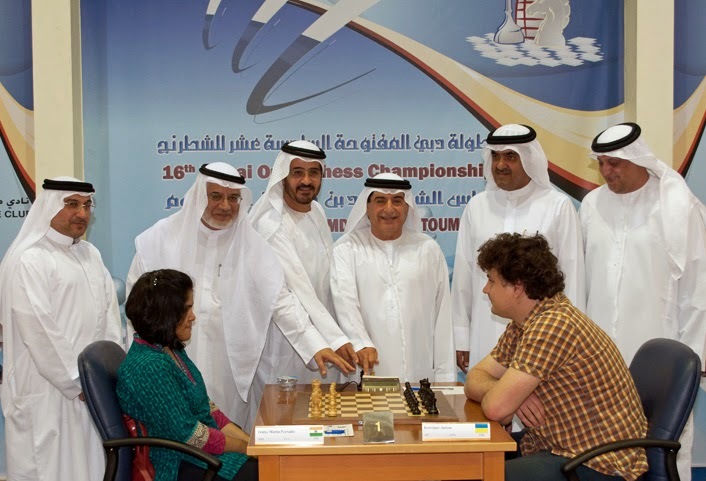 Dubai Chess Open 2014: Grandmaster and former world junior champion Abhijeet Gupta continued with his winning ways as he defeated Nezad Husein Aziz of Qatar to remain in joint lead with two points after the end of the second round of Dubai International Open chess tournament on Wednesday. 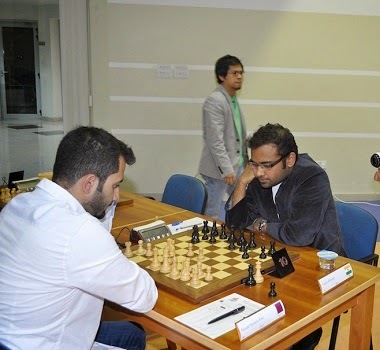 GM Abhijeet Gupta with black versus IM Nezad of Qatar. Jobannie Tabada of the Philippines looks on. On what turned out to be a tough day, Gupta had to sweat it out with his black pieces against Aziz who had done a good home work. The Grunfeld defense met with an opening surprise and the Indian had his back to the wall and only some deft defense allowed him to stay in the game. Aziz missed his chances when the endgame arrived and allowed counterplay when he could have avoided that. Gupta, from a pawn less, came up with an extra pawn when the dust subsided and the rest was easy. Young Indian V Karthik stole the honours in the second round while Siva Mahadevan came out with another fine performance. 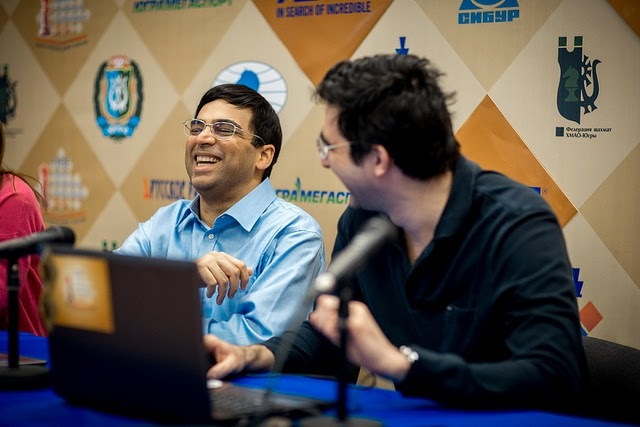 Karthik defeated Athanasios Mastrovasilis of Greece with white pieces showing depth of understanding in the endgame while Mahadevan drew with Gawain Jones of England in a game with wild complexities. Another good result was achieved by Prince Bajaj who got a half point against higher ranked Grandmaster Viorel Iordachescu of Moldova. With seven rounds still to come in the $50000 prize money tournament, as many as 27 players remain in joint lead with a perfect score. Apart from Gupta, Grandmasters Debashish Das, M Shyam Sundar and Sahaj Grover are among the pack of leaders and other Indians enjoying a clean slate are Karthik and Diptayan Ghosh. Karthik showed his endgame skills against Mastrovasilis out of a Ruy Lopez opening as white. 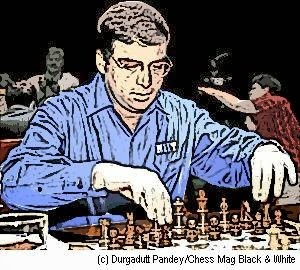 The Brayer variation by the Greek Grandmaster gave Karthik a small advantage and he posted his knight on the sixth rank to cause the damage once the queens got traded. Mastrovasilis could only watch as the Knight created havoc and won a couple of pawns without any compensation. The game lasted 58 moves. 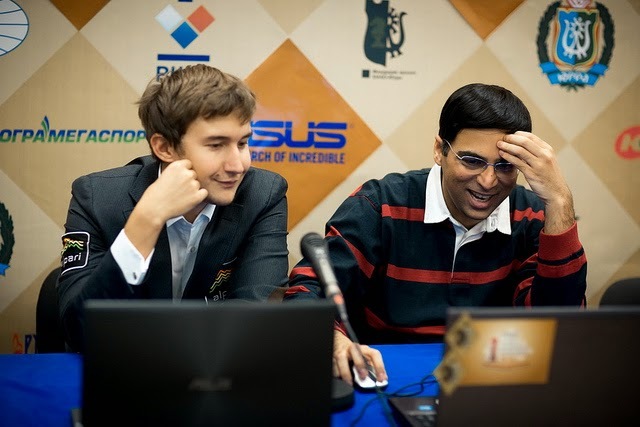 Important and Indian results Round 2 (Indians unless specified): Anton Korobov (Ukr, 2) beat Jahongir Vakhidov (Uzb, 1); Gudmundur Kjartansson (Isl , 1.5) drew with Vladimir Akopian (Arm, 1.5); Romain Edouard (Fra, 2) beat Ashwin Jayaram (1); Constantin Lupulescu (Rou, 2) beat Swapnil Dhopade (1); Csaba Balogh (Hun, 2) beat Sayantan Das (1); Nezad Husein Aziz (Qat, 1) lost to Abhijeet Gupta (2); C R G Krishna (1) lost to Stevic Hrvoje (Cro, 2); Prince Bajaj (1) drew with Viorel Iordachescu (Mda, 1.5); Rinat Jumabayev (Kaz, 2) beat Abhishek Kelkar (1); Alojzije Jankovic (Cro, 2) beat Aniruddha Deshpande (1); V Karthik (2) beat Athanasios Mastrovasilis (Gre, 1); Debashis Das (2) beat Turar (Kaz, 1); Alshaeby Boshra (Jor, 1) lost to Diptayan Ghosh (2); Nandu Gagarin (1) lost to M Shyam Sundar (2); Sahaj Grover (2) beat Gustav Halvarsson (Swe, 1); Gawain Jones (Eng, 1) drew with Siva Mahadevan (1); M R Lalith Babu (1.5) beat Alipasha Guliyev Gasan (Aze, 0.5); S Ravi Teja beat Tarek Altaher Salman (Uae, 0.5); Niusha Afshar (Iri, 0.5) drew with Ivana Maria Furtado (0.5); Rafee Mohd Hayel (Syr, 0.5) drew with Pratyusha Bodda (0.5); Nishant Malhotra (1) beat AkshayHalagannavar (0); Elnaami Hashem (Lba, 0) lost to Nimmy George (1); Abdulla Al-Hamed (0) lost to Harshal Shahi (Uae, 1). 16th Dubai Chess Open 2014: DUBAI (UAE): Highest ranked Indian in the fray Abhijeet Gupta (left) got off to a flier, defeating Osman Abdelgadir of Sudan, while Grandmaster M R Lalith Babu was held to a draw by Elena Partac of Moldova in the first round of the 16th Dubai International open chess that got underway on Tuesday. It turned out to be a good day in the office for Gupta as he had to exert little for a maximum result against Abdelgadir. PLaying the white side of an English opening, Gupta got an early advantage and then spotted a simple tactic to earn a knight for just a pawn. The rest was easy. Lalith Babu faced an early wake up call by Partac who matched the Indian move for move despite a hige desparity in ratings. It was a Caro Kann defense by Babu wherein Partac played a less played system and the game was always close to equal. Babu fancied his chances in the rook and pawns endgame but Partac was equal to the task as she gave nothing away. After 87 moves the draw was agreed to leaving both players on a half point after the first round. The opening day was not devoid of upsets usual for a strong tournament like the Dubai open. Highly regarded Grandmaster Tigran Petrosian went down to Mona Khaled of Egypt while Gawain Jones of England had to part with a half point against Narmin Khalafova of Azerbaijan. Amongst the Indians, Siva Mahadevan came out with a good result holding Russian Grandmaster Sergey Volkov to a creditable draw. It was a typical hit-and-miss game as Mahadevan got a winning position after capturing Volkov's queen for just two minor pieces but missed a simple blow that cost him a rook. Volkov thought he had chances but the Indian fought back to win the rook for his passed pawn and the Russian was lucky to find a fortress. The game lasted 104 moves. The Indian GMs had a good day apart from Lalith Babu. Debashish Das got the better of compatriot Harshal Shahi, Niusha Afshar of Iran proved no match against M Shyam Sundar while Sahaj Grover excelled at the expense of Ahmed Elgantiry of Egypt. At the top of the tables, Anton Korobov scored over Asian junior girls' champion Ivana Maria Furtado in a game where the Indian girl fought hard. Nishant Malhotra was the other Indian on the receiving end despite putting up a brave show against Grandmaster Stevic Hrvoje of Croatia. The Dubai open is one of the strongest Asian open with $50000 as prize fund. The tournament will be played over nine rounds. 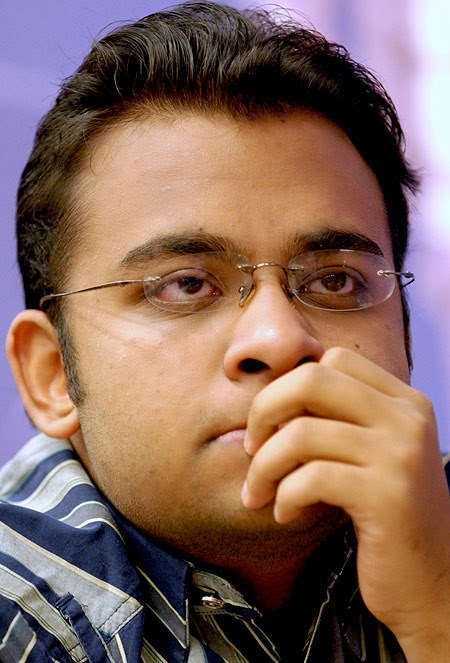 DUBAI (UAE): Grandmaster and former world junior chess champion Abhijeet Gupta will start as the highest rated Indian in the strong Dubai International open chess tournament that gets underway here on Monday. A winner of this tournament in 2011, Gupta recently won the Al-Ain Classic in UAE and the country remains one of his favourite grounds. The Indian is ranked 12th in one of the strongest open tournament in Asia. Anton Korobov of Ukraine starts as the top seed. The semifinalist of the last world chess cup had also won the AICF-AAI cup in Delhi in December 2012 and remains a feared opponent. 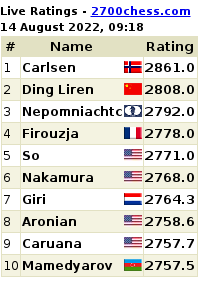 Apart from Korobov, Vladimir Akopian of Armenia, French duo of Romain Edouarda and Andrei Istratescu, Romanian Constantin Lupulescu and Csaba Balogh of Hungary are other players above 2650 ELO rating in the tournament. 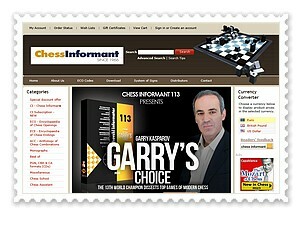 The tournament will be played under FIDE's Swiss rules and there will be nine rounds in all. The total prize pool is 50000 USD out of which the winner will take home 10000 USD. As usual, the 16th edition of the Dubai open has attracted a variety of Indian players. There are 30 Indians in the fray in a list that boasts of 160 players currently but is likely to go up by the time the first round starts at the Dubai Chess and Culture Club. There are as many as 40 Grandmasters in the fray apart from 22 International Masters, eight Woman Grandmasters and three Woman International Masters making the total number of titled players over 70. Apart from Gupta, the Indian interest will revolve around Grandmasters M R Lalith Babu, Debashish Das, M Shyam Sundar and Sahaj Grover. International Masters Deeptayan Ghosh, Swapnil Dhopade and Ashwin Jayaram will be looking forward to a performance which will take them closer to the Grandmaster title while the other Indians are all IM norm aspiarants. 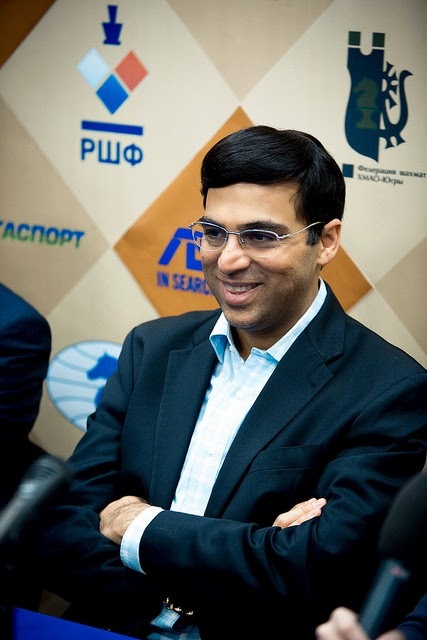 The event will be followed by Asian Continental championship in Sharjah and for Gupta and other Indian GMs it will be crucial to be in good shape for the real test that begins soon after the Dubai open. "This tournament remains one of my favourite events across the world as the players are taken care off well and the playing conditions are excellent too," said Abhijeet Gupta while gearing up to play the first round late on Tuesday. Chessboxing Spectacular Season begins April 12 London Scala Nightclub! Adrenaline rush, attack, counter attack... find that ultimate brain-brawn sport: Check out 'Chessboxing'! The start of the Chessboxing Year at the iconic Scala nightclub in King’s Cross, London is set for April 12. The “Season Opener” is always an outstanding event and 2014 promises to be one of the best years yet with a host of new faces arriving on the London Chessboxing stage. We’ll witness the debut of some terrific young talent including Londoners Toby “Slowby” White, Gavin Patterson and Eduard Lleshi. We’ll also see experienced chessboxers Matt “Crazy Arms” Read and rising star Nick “Showstopper” Cornish back in the ring as well as Scala’s favourite George Crespo. Furthermore, the talented fighters “Slick” Ricky Brown and Richard “The Razor” Frazer will join us again for what promises to be nothing short of a spectacular chessboxing season opener. A thrilling evening of chessboxing, entertainment and excitement awaits! The event will also feature live interval cabaret, DJ Buchman plus special guests. After the show you can enjoy board games and dancing at a long-running after-party in the Scala’s atmospheric Balcony Bar. *VIP tickets include a generous supply of “performance enhancing” cocktails, served throughout the evening. Tickets are available now @ “Buy Tickets” page! THE LINE UP IS CONFIRMED!